MELBOURNE, Australia — Rafael Nadal had a good, hard look at the future before pulling a few tricks from his past to hold it back — for now. 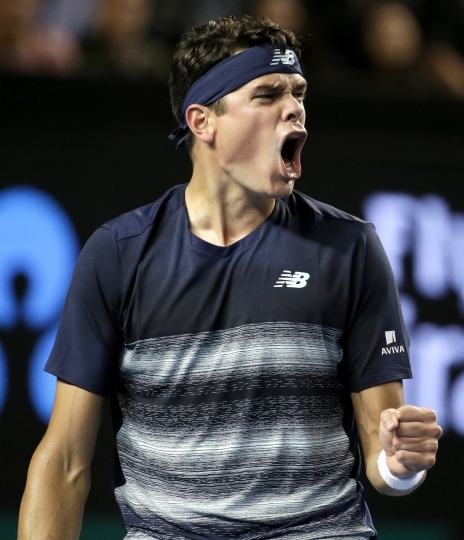 The 14-time Grand Slam winner, still recovering from a couple of months off with an injured left wrist, rallied for a 4-6, 6-3, 6-7 (5), 6-3, 6-2 win over German teenager Alexander Zverev on Saturday to reach the fourth round of the Australian Open. 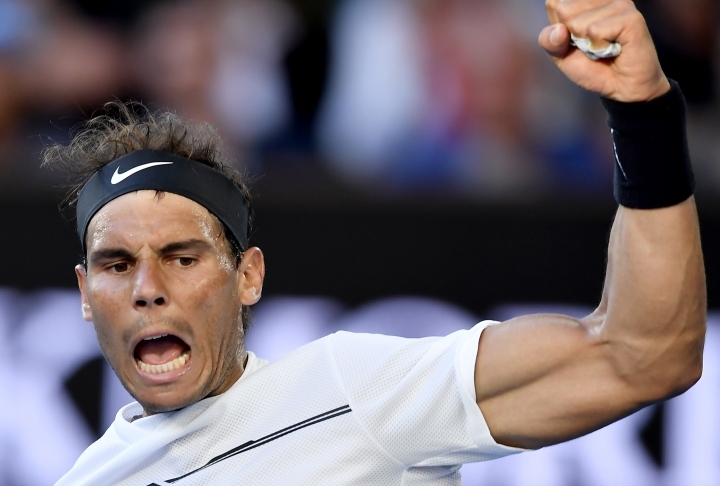 The 30-year-old Spaniard finished stronger in the 4-hour, 6-minute match on Rod Laver Arena as Zverev, widely touted as a Grand Slam champion of the future, tightened up with cramping and nerves. "I enjoyed a lot this great battle. I was losing the last couple of times in the fifth set and I said to myself, 'Today's the day,'" said ninth-seeded Nadal, who had lost eight of the previous nine times he'd trailed 2-1 in a best-of-five-sets match. Nadal attributed his superior finish to the experience of 236 previous matches in the majors. "Well, fighting — and running a lot," Nadal said, when asked to explain how he pulled off the win. "I think you know, everybody knows how good Alexander is. He's the future of our sport and the present, too." It was 19-year-old Zverev's 15th Grand Slam match, but he had been on a three-match winning streak against top 10 players. "Now I'm disappointed, but I know that this was a great match," he said. "That was a great fight. "He's probably one of the fittest tennis players in the history of the game, so ... there are a lot of positives in this match." Nadal finished with 43 winners and 34 unforced errors, while Zverev — hitting harder, using a wider array of shots and trying more to find the lines — had 58 winners and 74 unforced errors. 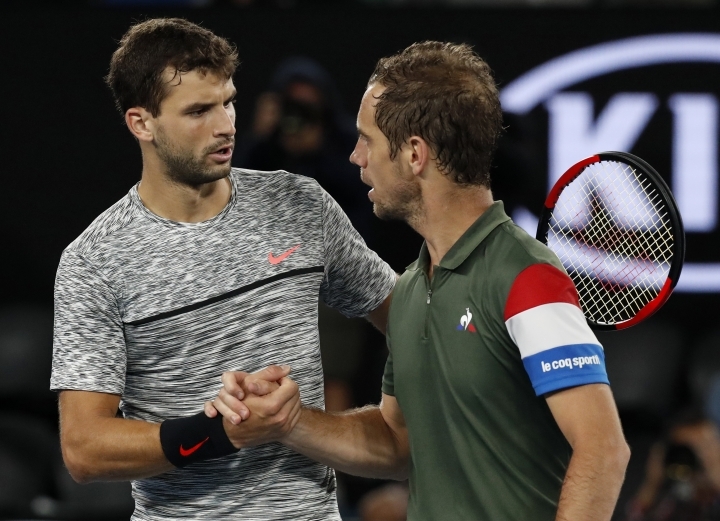 Grigor Dimitrov and Richard Gasquet didn't start their third-round match until 11:58 p.m. local time, most likely the latest start for a match at the Australian Open. After grinding through four games in 24 minutes, No. 15 Dimitrov picked up pace and finished off 6-3, 6-2, 6-4 at 2 a.m. — well short of the Grand Slam record 4:34 a.m. finish for the match between Lleyton Hewitt and Marcos Baghdatis in 2008. 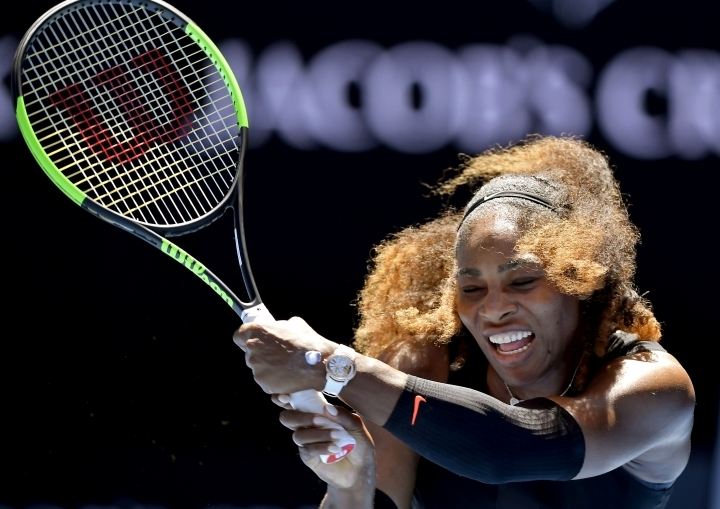 Serena Williams has had time on her side, reaching the fourth round without dropping a set to stay on course in her bid for a record 23rd Grand Slam title. Williams beat fellow American Nicole Gibbs 6-1, 6-3 and didn't face a break point until she was serving for the match. Dropping serve in that game was her only lapse in a match that then extended just beyond the hour — to 63 minutes, to be precise. The six-time Australian Open champion next faces No. 16 Barbora Strycova. "I don't have anything to prove in this tournament here. Just doing the best I can," Williams said. "Obviously, I'm here for one reason." In one of two matches that finished just before midnight, U.S. Open runner-up Karolina Pliskova rallied from 5-1 down in the third set to beat Jelena Ostapenko 4-6, 6-0, 10-8. Ostapenko twice served for the match and twice she was broken, winning only one point in each game. In the other, No. 22 Daria Gavrilova beat 12th-seed Timea Bacsinszky 6-3, 5-7, 6-4 on Rod Laver Arena, delaying the start of the last match of the day. Earlier, Wimbledon finalist Milos Raonic reached the fourth round with a 6-2, 7-6 (5), 3-6, 6-3 win over No. 25 Gilles Simon and will next play No. 13 Roberto Bautista Agut, who beat David Ferrer 7-5, 6-7 (6), 7-6 (3), 6-4. Nadal will get another veteran next after U.S. Open semifinalist Gael Monfils beat Philipp Kohlschreiber 6-3, 7-6 (1), 6-4. In another gripping five-setter, but on an outside court, wild-card entry Denis Istomin followed his upset win over defending champion Novak Djokovic with a 6-4, 4-6, 6-4, 4-6, 6-2 victory over Pablo Carreno Busta. No. 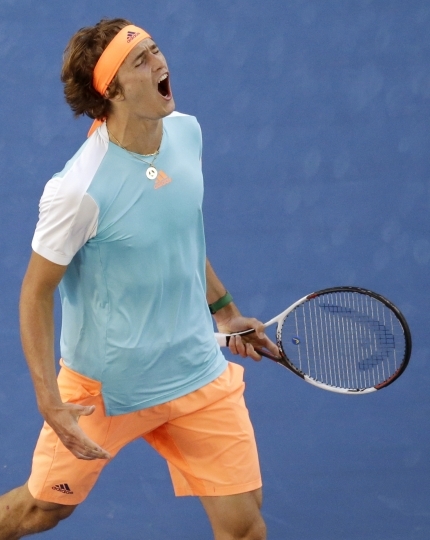 8 Dominic Thiem beat Benoit Paire 6-1, 4-6, 6-4, 6-4 to set up a fourth-round match against No. 11 David Goffin, who ended Ivo Karlovic's run 6-3, 6-2, 6-4. In other women's matches, Ekaterina Makarova beat WTA Finals champion Dominika Cibulkova 6-2, 6-7 (3), 6-3. 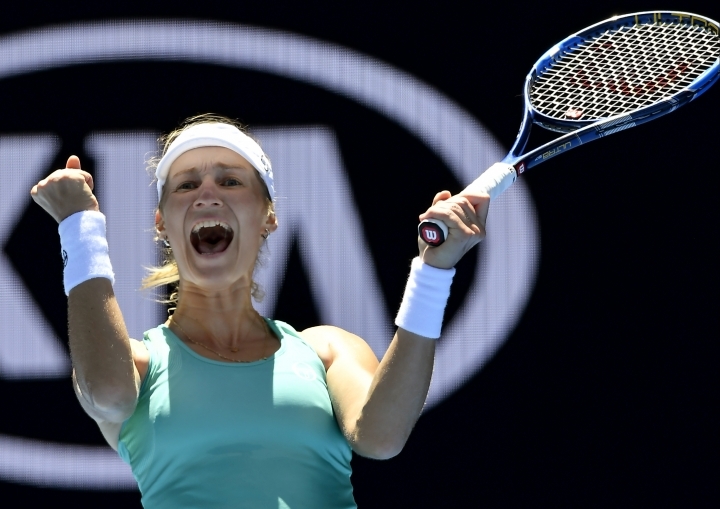 In a rematch of their fourth-round meeting last year, Makarova will next take on 2016 semifinalist Johanna Konta, who beat former No. 1-ranked Caroline Wozniacki 6-3, 6-1. Mirjana Lucic-Baroni continued her unlikely run with a 3-6, 6-2, 6-3 win over Maria Sakkari, and so did American qualifier Jennifer Brady. Before this week, the 34-year-old Lucic-Baroni hadn't won a match at Melbourne Park since her debut in 1998. The 19-year gap in between match wins at a Grand Slam tournament broke the record set by Kimiko Date-Krumm. A semifinalist at Wimbledon in 1999, Lucic-Baroni next plays No. 116-ranked Brady, who had never played in the main draw of a major before she qualified for this week. Brady, 21, had a 7-6 (4), 6-2 win over 14th-seeded Elena Vesnina in the first match of the day on Show Court 2.